On Tuesday 19th June I’ll be presenting at the Institutional Web Manager Workshop (IWMW) in Edinburgh … twice! Tony Hirst and I are continuing our tour, which started at the JISC CETIS Conference 2012, before hitting the stage at GEUG12. For IWMW12 we are doing a plenary and workshop around data visualisation (the plenary being a taster for our masterclass workshop). I’ll be using this post as a holder for all the session resources. Update: I’ve also added Tony Hirst’s (OU) slides. Tony went on first to introduce some broad data visualisation themes before I went into a specific case study. The draft slides for my part of the plenary are embedded below and available from Slideshare and Google Presentation (the slides are designed for use with pptPlex, but hopefully they still make sense). For the session I’m going to use the OER Visualisation Project to illustrate the processes required to get a useful dataset and how the same data can be visualised in a number of ways depending on audience and purpose. Update: I should have said the session should be streamed live, details will appear on IWMW site. Update: As a small aside I’ve come up with a modified version of Craig Russell’s UK Universities Social Media table as mentioned in Further Evidence of Use of Social Networks in the UK Higher Education Sector guest post on UKWebFocus (something more ‘glanceable’). 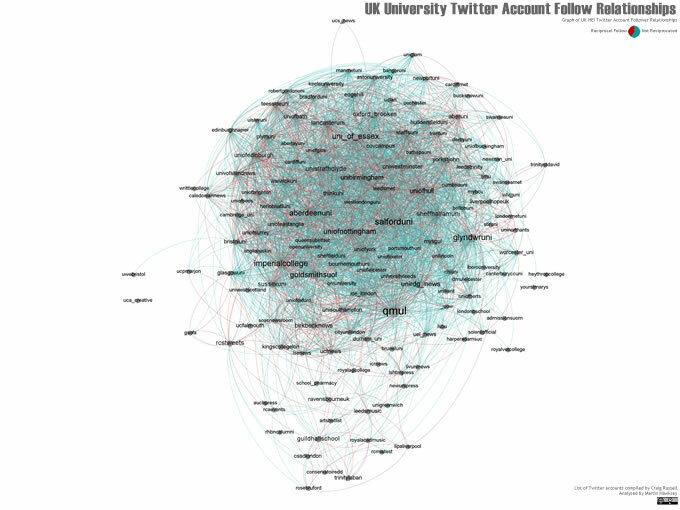 Using the Twitter account list as a starting point I’ve looked at how University accounts follow each other and come up with this (click on the image for an interactive version). If you have any questions feel free to leave a comment or get in touch. Sounds fantastic Martin. I look forward to the sessions.